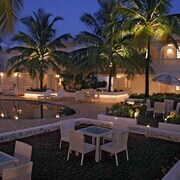 Situated by the ocean, this hotel is steps away from Sernabatim Beach and Colva Beach. Benaulim Beach is 0.6 mi (1 km) away. 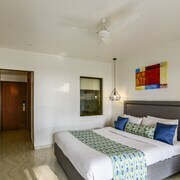 Offering direct access to the beach, this Colva hotel is within a 10-minute walk of Sernabatim Beach and Colva Beach. Benaulim Beach is 2 mi (3.2 km) away. 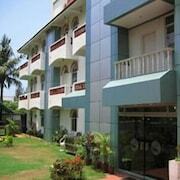 Situated near the beach, this hotel is within 1 mi (2 km) of Sernabatim Beach and Colva Beach. Benaulim Beach is 2.3 mi (3.7 km) away. 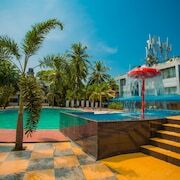 This family-friendly Colva resort is located near the beach, within 1 mi (2 km) of Sernabatim Beach and Colva Beach. Benaulim Beach is 2.8 mi (4.5 km) away. 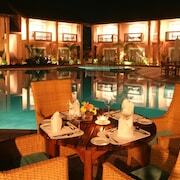 Situated in Colva, this hotel is within a 5-minute walk of Sernabatim Beach and Colva Beach. Benaulim Beach is 1.8 mi (3 km) away. 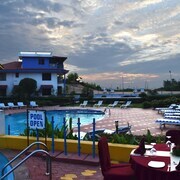 Nestled on the beach, this Colva resort is just steps away from Sernabatim Beach and Colva Beach. Benaulim Beach is 0.5 mi (0.8 km) away. 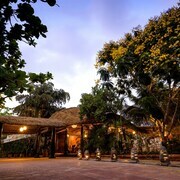 Very central location in village. Near to beach and bus stop. Hotel is clean. Staff friendly and helpful. Restaurant offers a good variety of food available. Visitors give high marks for the beaches in Colva, which is also known for its entertainment and gardens. Tourists can also enjoy the city's seafood restaurants and monuments. Around the area, top sights include Arossim Beach, Varca Beach and Cavelossim Beach.